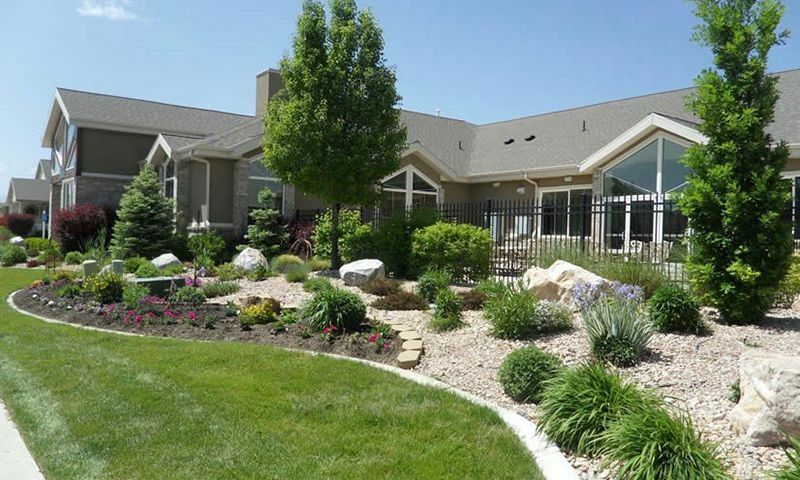 Brookhaven Villas is a 55+ community in scenic Lehi, Utah. This active adult neighborhood features beautiful single-family homes that offer spacious floor plans with energy efficient designs. Homeowners will enjoy the safety and security of living in Brookhaven Villas. They will also enjoy maintenance-free living thanks to the homeowners' association (HOA) covering tedious exterior home chores. Brookhaven Villas offers a great line up of amenities at the elegant clubhouse that's the perfect gathering place for social events with friends and family. Located in Lehi, UT, residents are never far from recreation, shopping, and dining options. Big-city attractions and the Salt Lake City Airport can also be reached within a short drive from the community's gates. The elegant clubhouse is the central hub of physical and social activity in Brookhaven Villas. Residents can stay in shape by working out in the exercise room or swimming a few laps in the indoor pool. After an invigorating workout, they can relax in the spa. Homeowners can meet with friends in the lounge area to watch T.V., listen to music, or just socialize with neighbors. A catering kitchen and multi-purpose room are perfect for hosting small or large parties. Outdoor amenities are superb as well. Residents can challenge neighbors to a friendly game of horseshoes or mingle on the patio. They can show off their grilling skills in the BBQ and picnic areas during the warmer months of the year. A beautiful community garden, scenic walking trails, and plenty of parks and natural space are the perfect setting for enjoying events outside. Construction of Brookhaven Villas began in 2004 and has a total of 120 single-family homes. Brookhaven Villas offers homebuyers five unique floor plans that are perfect for the active adult. These detached homes offer 1,489 to 1,950 square feet of living space. They have two bedrooms, two bathrooms, and an attached two-car garage. These homes feature one-story living, upgraded designer kitchens, crown molding, spacious living areas, full basements, large walk-in closets, insulated garages, and energy-efficient designs. Residents enjoy a carefree lifestyle in Brookhaven Villas. An affordable homeowners' association fee covers lawn maintenance, snow shoveling, common grounds maintenance, security, and use of recreational facilities. Homeowners have more time to do fun things thanks to the maintenance-free homeownership in Brookhaven Villas. Residents can participate in community parties, activities, and events. They can host events in the clubhouse or get-togethers in the BBQ area. Green thumbs can share their interests while spending time in the gardens. Leisurely strolls are made possible with the scenic walking and biking trails surrounding the neighborhood. Brookhaven Villas is ideally situated in Lehi, Utah. Residents are near major roads like Interstate 15, which makes driving across town a breeze. Everyday conveniences are within driving distance from the community, such as Cabela's, Outlets at Traverse Mountain, Lehi Legacy Center, Burger King, and Smith's. There are plenty of parks and outdoor spaces for recreational activities such as M. Timpanogos, Mill Canyon Peak, Twin Peaks, and Mahogany Mountain. Salt Lake City and its international airport can be reached in about 30 minutes. Brookhaven Villas is a great 55+ community in Utah with plenty to offer active adult homebuyers. There are plenty of activities available in Brookhaven Villas. Here is a sample of some of the clubs, activities and classes offered here. Brookhaven Villas offers homebuyers unique floor plans that are perfect for the active adult. These single-family homes offer 1,489 to 1,950 square feet of living space. They have two bedrooms, two bathrooms, and an attached two-car garage. These homes feature upgraded designer kitchens, crown molding, spacious living areas, full basements, large walk-in closets, insulated garages, and energy efficient designs. 55places.com is not affiliated with the developer(s) or homeowners association of Brookhaven Villas. The information you submit is distributed to a 55places.com Partner Agent, who is a licensed real estate agent. The information regarding Brookhaven Villas has not been verified or approved by the developer or homeowners association. Please verify all information prior to purchasing. 55places.com is not responsible for any errors regarding the information displayed on this website.